Today, lets talk about something sensational, shall we?? 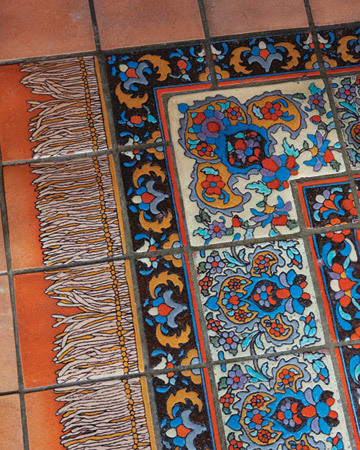 Unfortunately, its not something from the gossip columns of a tabloid, and yet its newsworthy in the design world :-) Have you ever seen, or heard of a tiled carpet?? I had not, and it did take me by surprise!! 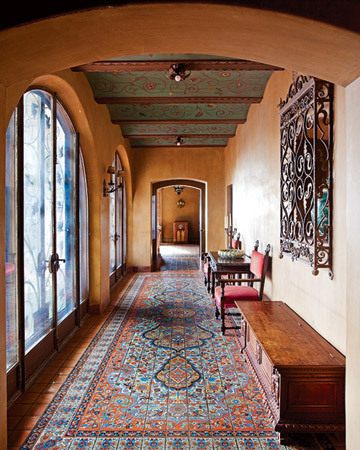 This intricate and gorgeous Persian-style tile "carpet" was conceived by William Handley, a designer for Malibu Pottery. 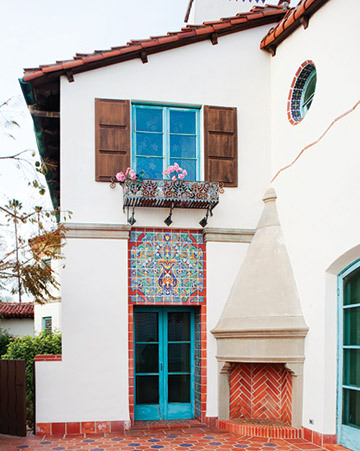 Incidentally, this house at the time belonged to the owners of Malibu Pottery in California. The elaborate pattern, which includes more than 670 tiles, was created using cuerda seca glazing. What do you think?? I think it looks grand.....and makes a statement! The whole house is one of my favorites...the stair risers are fabulous too! I think that is sublime! I remember a long tine ago reading of a garden, in Sunset Magazine, where they had laid mosaic tiles in the pattern of oriental carpets. I thought it was so imaginative that I wanted to do the same thing. Hi and it's nice to meet you! Yes, I've heard of Malibu tiles and have seen some on line but never in person. I do love that look! Lovely house too! I think it's stunning! I just love it! So colorful, creative and very different! Oh so gorgeous...the whole entryway looks stunning! Beautiful in the house. 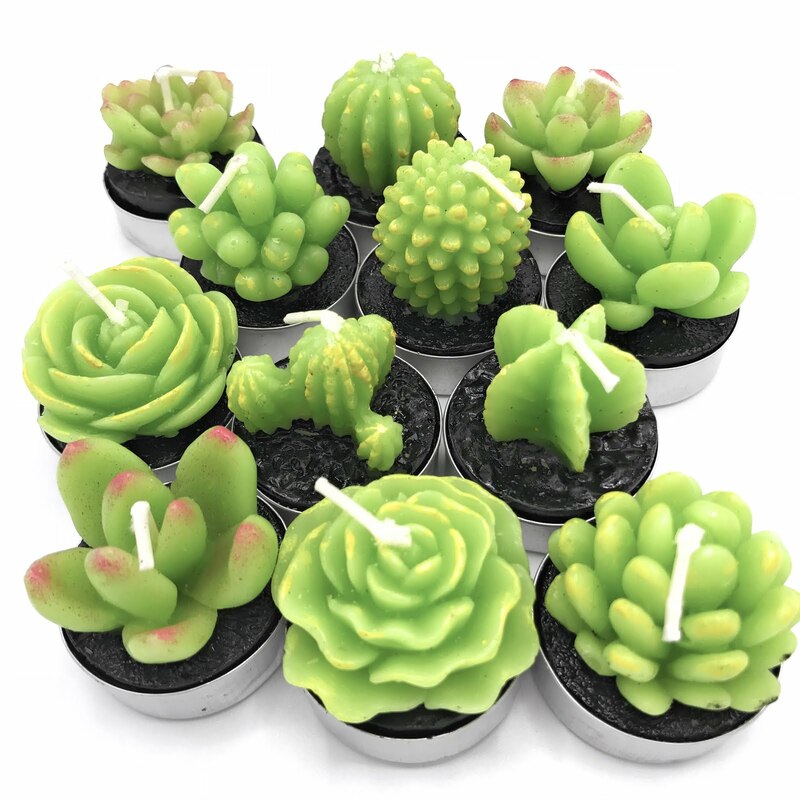 I would want to be sure to use colors that would be easy to decorate around any decor changes I wanted to make. I saw something similar to this type of tile a while back, but don't remember where. If this is a dup. comment - sorry. I am having problems commenting today. What a wonderful idea! love it! Thankyou for coming to my blog and introducing yourself to me - I have had a wonderful time scrolling through your blog and the beautiful interiors. Thank you. Wow - I've never seen a tile 'carpet' before. Its lovely - think it would need a large home so its not overpowering. Lovely find Anu! Just wow - I love it!